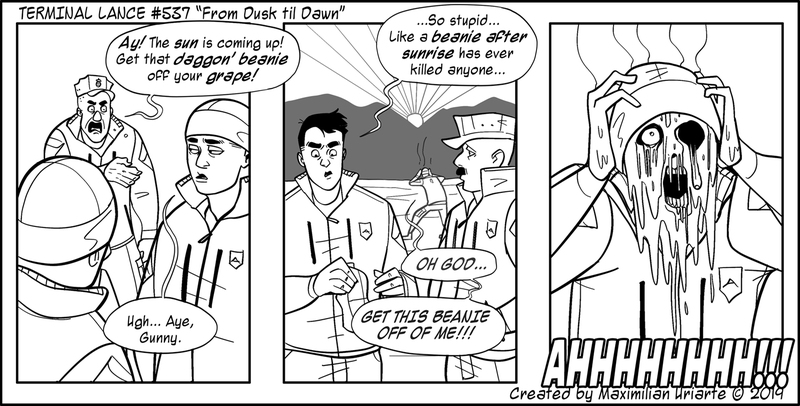 Gunny and his Staff NCO friends have been trying to warn us for years the dangers of keeping a beanie hat on after sunrise. No matter the temperature outside, whether it be positive or negative 30 degrees in the immediate area around your bivouac, you will not wear a beanie hat once the sun comes up. Them’s the rules, Gunny just enforces it. Why? Well, you can see the consequences of such hubris. Beanie hats are the devil’s gear, and the warming, holy rays of the sun react quite violently with it. God only knows what happens if you keep your hands in your pockets or wear white socks… I dunno about you, but I’d rather not risk it to find out. The sun is a strange thing in Marine culture… When it is up, you must act and look professional at all times, whether you’re in the field or not. When it’s down? Bivvy sacks come out, beanies go on, skivvies come off, red flashlights light up; it becomes a free-for-all. Anything goes once the lights are out, so long as firewatch doesn’t stop you. Enjoy those long nights in the field, because once the sun comes up, the beanies come off.